Wes Anderson's Moonrise Kingdom won Best Feature tonight at the IFP Gotham Independent Film Awards tonight in New York, while David France's How to Survive a Plague took Best Director. Benh Zeitlin's Beasts of the Southern Wild, meanwhile won two awards including the Breakthrough Director prize and the inaugural Bingham Ray award. Moonrise Kingdom actors Bob Balaban took to the stage with fellow actors noting that if "Wes Anderson asks you to be in a movie...just be in it." Anderson was a no-show, however, for the big win. 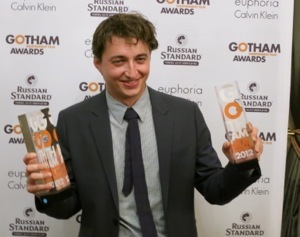 Zeitlin took Best Breakthrough Director for Beasts of the Southern Wild. Taking to the stage, he said he hopes more people gets the kind of "freedom" he had to make his film which won Sundance earlier this year and the Camera d'Or in Cannes earlier this year. Zeitlin also won the inaugural Bingham Ray Award which honors a "promising emerging filmmaker." How to Survive a Plague won Best Documentary. The film captures the ACT-UP movement and the push to get antivirals through government roadblocks. The emotional doc won accolades at Sundance. "It's a story not about what AIDS did to our community, but a story about what our community did to HIV," said director David France. Best Ensemble Cast went to Your Sister's Sister. Actor Mark Duplass thanked his fellow actors Rosemarie Dewitt and Emily Blunt for their work only making $100 a day. The film beat out the likes of heavy-hitting Oscar contender Silver Linings Playbook as well as Moonrise Kingdom and Bernie. Said an excited Emayatzy Corinealdi about her Best Actor win: "This time last year I was at home eating Frosted Flakes... But to go from Sundance to Gotham with [Middle of Nowhere] is a dream for me...This role doesn't come around often, so I'm grateful." Many many thanks for taking the time to mention this, I experience strongly about this and enjoy learning far more on this specific matter. If doable, as you get expertise, would anyone mind updating your web site with a great deal more details? It’s extremely good for me. Added your blog to share with friends. Thanks again for another good post by you.